Pours a cloudy golden color into a tulip glass. Minimal head that disappears quickly, no lacing. Aroma is fairly weak and non-descript. Taste is also neutral, hard to describe, much like an American light beer, in that has little to recommend it, or to give a negative impression. Mouthfeel is actually pretty good, a little strong on the carbonation despite the lack of a head, a little bit like champagne. Tasted from 11.2oz bottle. Pours pale yellow with a huge, foamy white head. Nose is yeasty with candy malt and some orange and spices. The flavor is slightly bitter with some candy malt and wheat. The carbonation is heavy with a light body and a longish bitter finish. Appearance: pours a hazy yellowish orange color with a one inger head that lasts a while. Smell: a general spiciness and hint of floral hops rise from the glass. Taste: yeast, light spiciness, green grapes, mild fruity sweetness and a mild bitterness makes up a simple but pleasant ale. Mouthfeel: crisp throughout with some mild dryness at the finish. A strong yeast laden aftertaste sticks to the tongue. Medium bodied beer. Drinkability: definite sessionable beer. Nice flavors keep it intereting the whole way. Poured a golden-orange color, nearing brown at its depth. Medium head that dissipated quickly, leaving little to no carbonation after initial pour. Tastes like a standard belgian ale, I wouldn't call it "hoppy" as the bottle claims. Nothing spectacular, but certainly not below-average. The "hoppy" aspect is more noticeable in the smell, along with additional floral generalities. Taste is crisp on the palate, finishing smoothly with extremely high drinkability. Mouthfeel is above-average, along with taste, and is accompanied by notes of acid and a slight hop aftertaste. Overall, not an outstanding beer, but a very good "hoppy" belgian ale. I wouldn't go out of my way to find it, but my local store just received a large amount of de graal beers and this sounded interesting. Fairly solid for a $7.99 750ml bottle. This beer is highly drinkable with a solid flavor both as it hits the palate and in its aftertaste. A pretty good find. Best before 09-05 so in time for a revieuw. Pours in wel with its golen colour an perfectly white head. Clear colour make it a good appearance. Smell is sweetmalty and spicy. Not the freshness I expect from a blond but acceptable. Taste is sweet again, honeymalty and i think to notice something to detect of koreander, gagel and paradijszaad. Acceptable but ending dull. Hardly any hops and yeasty aftertaste is not what you expect from a blonde. Acceptable butnot one I'm looking foreward too. 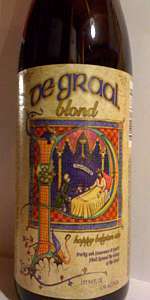 A nice Blond this but very conformist. A pale beer, almost yellow in colour and very clear. Not much nose as I remember but had quite a hoppy taste at first, though this soon fades to leave a very mild bitter finish. Very clean, crisp easy drinking beer. To be honest I was surprised it was 6.5% ABV, it drinks a tad weaker than that. I would imagine this would be make a great lunchtime drinking beer. Good, but very average for the style.